will surely jazz up the look of your home. 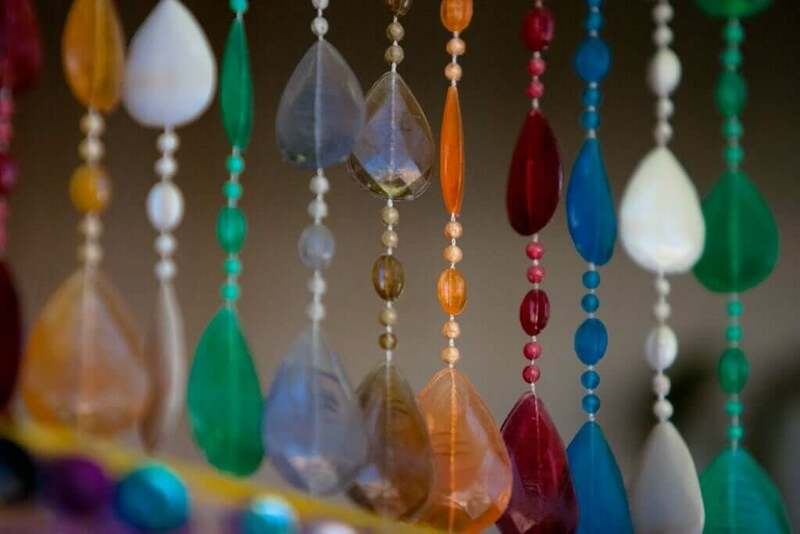 To get that perfect replication of a 60s bedroom design, read on to find out how you can make your own colorful curtain out of thousands of beads. Measure the area of space you are going to cover. Measuring this area will help you determine how thick your bead curtain should be as well as how far apart the strings of beads should be to one another. Before you start implementing your bead design, be sure your thread is a stronghold, heavy duty cord as a piece of crafts thread is likely to snap with the accumulated weight of the beads. For this project, I recommend a strong fishing line from a hardware or sporting goods store. Measure the length of the area, cut a section of the fishing line off and tie a knot at the bottom of the cord. This will prevent each bead line from scattering and coming undone. Once you determine the appropriate color scheme for your room, you can begin inserting beads to the fishing line as you see fit.
. Once everything is complete, transform your home interior by nailing your finished product over your door to showcase for your guests!